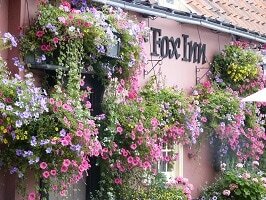 We are very proud of our hanging baskets , and with the number of customers who come back year after year to get their baskets and containers replanted by us, we think we are right to be! 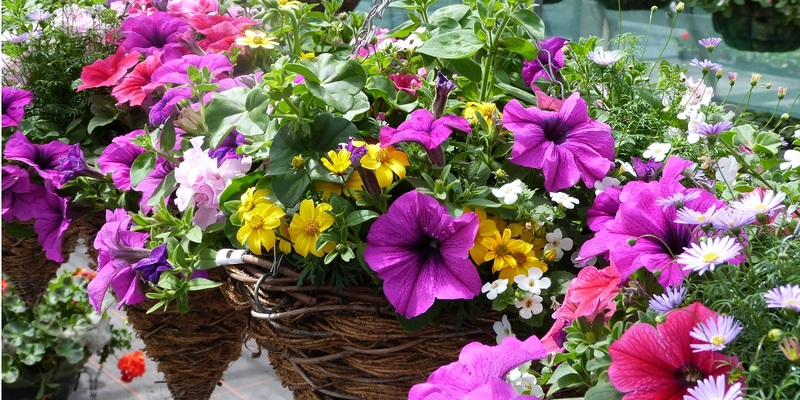 We do not stint when it come to our baskets - we use high quality compost, slow-release fertiliser and a generous dose of healthy happy plants for long lasting displays. 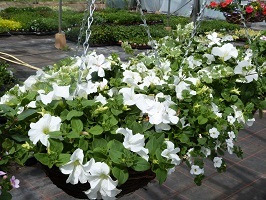 Summer hanging baskets are available from 1st May (weather dependent) but orders can be taken any time - tell us exactly what you want, or just leave it to our expertise. Order and pay before 30th April and get 10% off. 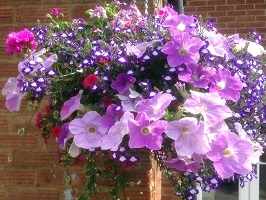 Beautiful pre-planted baskets are available throughout the season priced £16-£27. Refill prices are based on the size of your baskets and - if they are wire - if you would like the sides planted too, with prices starting from £15 for 12" diameter. 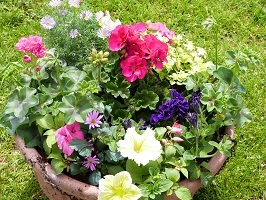 New baskets can also be planted to order. Choose from a range of styles of wicket baskets, from £3 plus filling. If you would like to make up your own baskets at home we have a wide range of suitable plants to choose from, from April onwards. 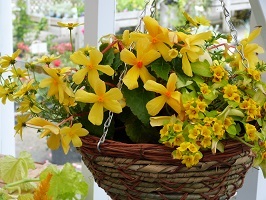 Click to see the Katie's Garden hanging basket recipe! Don't forget to add slow-release fertiliser to your compost. 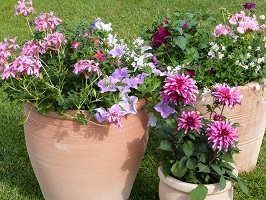 For a 14" basket we would recommend one upright plant for the centre, such as a zonal geranium, fuchsia, begonia or Madeira, surrounded by a mix of 4-6 trailing and semi-trailing plants. For a really full effect, busy lizzies (Impatiens) and bedding begonias are invaluable as "fillers". Begonias, Fuchsias, Impatiens and Violas are the best choices for shadier spots; Lobelias, Petunias and Bacopas can also perform well. Begonias and Fuchsias are also easy-care options as they need little deadheading. Zonal Geraniums and trailing Ivy Geraniums need less watering than most other hanging basket plants. There are a good number of plants that are beneficial to pollinators. Most single-flowered Fuchsias, Bacopas, Bidens and Diascias are attractive to bees. Try Verbenas, Lobelias and Heliotropes for the butterflies; and Petunias and Calibrachoas (Million Bells) for moths. 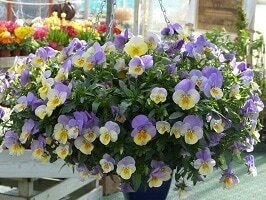 Orders for winter hanging baskets can be taken from September onwards, with prices starting from just £10 for mixes of pansies, violas and ivy. 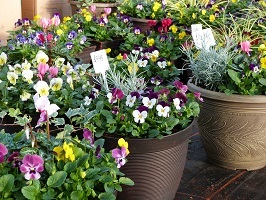 Our more expensive mixes can include Cyclamen, Goldcrest, trailing pansies and more.